While I grew up in the technological generation born in the 1990's, I have many fond memories as a child of writing to my grandparents. I still have a few of these letters, especially the ones which included my grandfather sitting down with his old typewriter. A few years back, I also dated a fella in the military and went through the process of writing him throughout basic training and so forth. Although this relationship ended badly, I still regard this as a transformational time in my life and has led me to believe that every gal should at one time or another receive a love letter. I still continue writing my grandmother to this day, although not with the frequency I would like. I get a far greater joy finding a letter in cute stationary from my grandma in the post office then I will ever be able to achieve from receiving an email...or an IM...or a text message...or...well you get the idea. I've spent some time over the years trying to figure out why this is. For one, it seems to be far more personal. The entire process does in fact take more time and because of that gives the impression that the person receiving is worth more time. With this also comes a sense of truth that I do not receive in other way of correspondence. It forces me to slow down a bit and actually go through the process of writing each letter in each word. Frankly, enough things in day to day life are rushed, therefore this is refreshing. In addition, the saved letters make valuable keepsakes...something that I can never picture an email being. I personally also find it to be more fun. 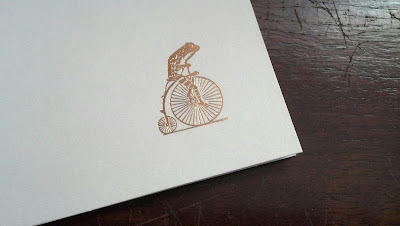 I certainly can't write an email on "Frog on a Bicycle" stationary. So what are your opinions on letters? Things of the past or glorious undervalued pieces of the present? Why do you love them or dislike them? That stationary is so cute! I agree, it is a lost art for sure. I've never been a good letter or card sender, but I think its something worth trying to be better at. Great post! I used to write letters all the time, I had about ten pen pals at one time, I was always getting nice writing paper for Christmas, I hardly even see it anymore in the stores. But, that was a long time ago, I still have my one dear penpal, but now it's all hi-tech communication! It's too bad, a letter is really a special thing! Quite true Jill, it really is something special!